You've worked hard all week. Whether it be on the job or at home with your family. You deserve to treat yourself! Get the bath salts, facial mask, and this sangria and then lock yourself in your bathroom for the next hour with a good book. Insta-spa day! In a small, heat-proof jar or bowl, stir together the sugar and boiling water to dissolve the sugar. 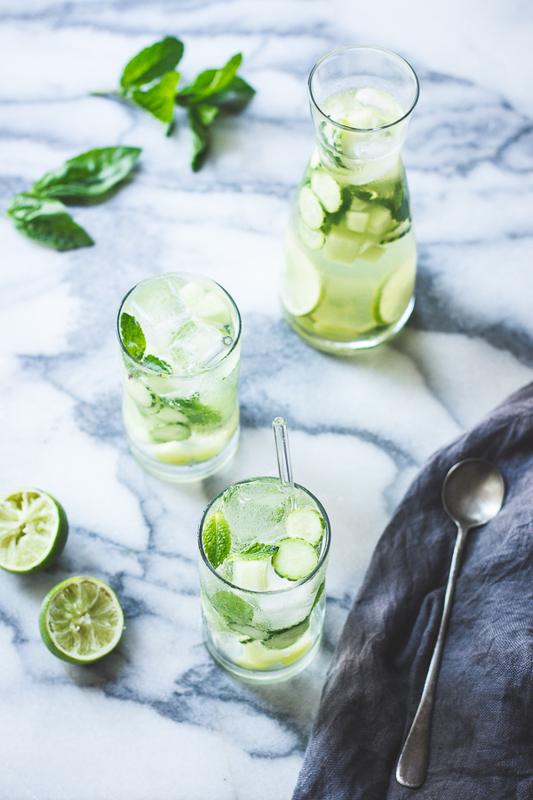 In a large vessel, such as a 2-quart mason jar, pitcher, or punch bowl, combine the cucumber, melon, grapes, lime slices, lime juice, mint, and basil. Pour in the Vinho Verde, rum, and simple syrup. Stir gently to combine, then cover and chill for at least 30 minutes or up to several hours. To serve, fill tall glasses with ice. Pour in sangrìa and spoon in some of the fruity bits. Top off each glass with a spritz of fizzy water and some pretty mint and basil leaves to garnish, and serve.